Manual labor is disappearing. Potters, glass blowers or cabinetmakers, to name just a few, are dying trades, and with their dwindling presence long traditions refined through the centuries fade. Electronics and the robotization of the manufacturing process erase the hand as a fabricating tool. Homo faber gives way to homo cyber. What a paradox that in the digital era, it is precisely the digit of the hand that disappears from the labor process. 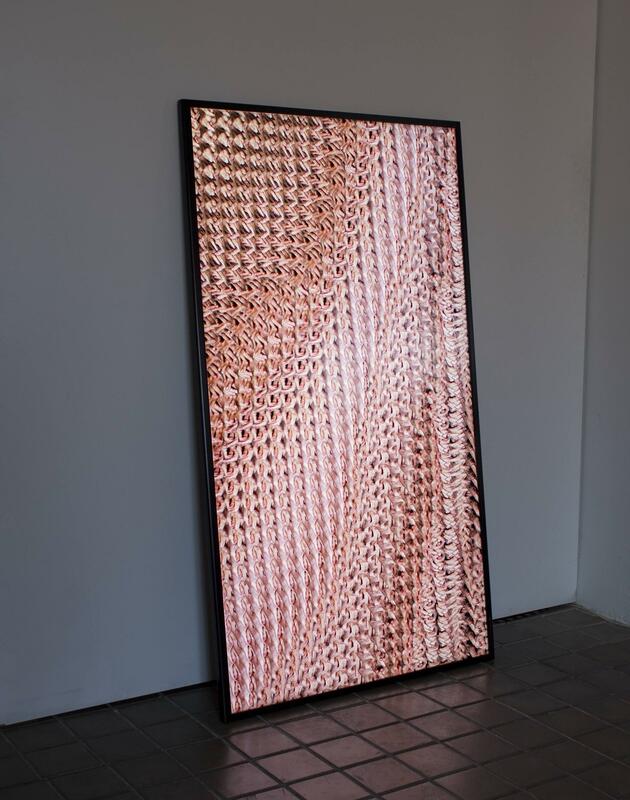 Plexus questions the hand of the artist as the origin of an artwork ni the digital era. The clusters of hands seen in the artwork -those of the artist- depict fingers weaving in the air to form undulating curtain-like formations. The rhythms of the hands resemble the choreaography of Busby Berkeley and Esther Williams´ films from the 1930s, as well as the use of humans as mass ornament in the Third Reich´s Nuremberg parades. Hands, so present through the history of art since the first cave paintings, here succumb to multiple synchronized rhythms, evoking the mass production of the global market. An important influence in the genesis of the artwork where Muybridge and Marey´s photographic human motion studies from the late 19th Century, as well as the optical effects of the 18th Century zoetrope that created movement on static images. In these pre-cinematic inventions human beings were incorporating themselves into the mechanical rhythms of the moment, of which photography and film were a product. In the present we are synchronizing ourselves to the new rigors of a digital culture. Plexus helps me reflect on how I want to incorporate, or resist, the unstoppable digital rhythms of today. It also helps me to find my own trace in the Electronic Age. 75 inch high-resolution screen display, generative animation, computer.